Build your own homemade go kart using this easy to follow go kart design by KartFab.com. Download the free PDF go kart plans now, and learn how to build a go kart. 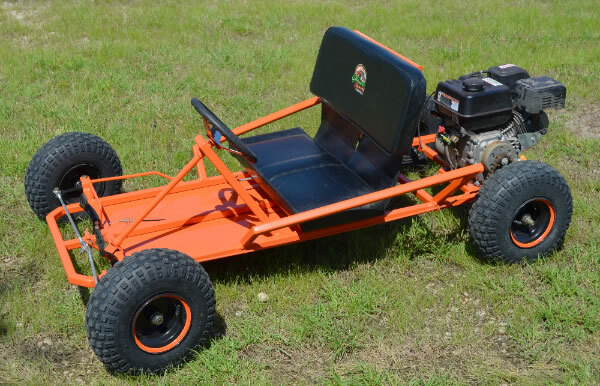 Watch the step-by-step video series for the go kart build on YouTube. little beefier arm and no oil zerk fitting. Original 8" seat sliders have been replaced with 11" seat sliders. Three additional steps have been added. 3) add two additional brackets to bottom of seat frame. a) first (most forward) set of brackets will attach seat, seat frame and seat slider. I have been looking around for sometime now for a Go Cart Kit . This was the best deal and quality of the products that I could find locally or on the internet. Just got our boxes a few days ago. They cam to S.W. Ontario, Canada in about 4 days - super easy no fuss. All the wheels came assembled, including the drive wheel. We'll see how everything works after the build is compete, but this certainly looks promising! downloaded free plans from kartfab. researched prices and couldn't find it cheaper. the big surprise was that the kit arrived in four days, just as my sons and were building the frame that weekend. the look on their faces was priceless as they pull parts from the box. Great for the DIY. I wish the kit came with the 5/8 spacers for the front spindles, would of saved a lot of time. Received on time and complete. Customer Service was quick to respond to my questions and the products are well built and perfect for a first time go-kart build. I ordered this kit to go along with the Kart-Fab free go-kart plans - I was very satisfied. The kit came quickly, many of the parts (eg, drive wheel) had been pre-assembled, and the engine started on the first pull. Thanks for putting together a great kit! Nicely packaged kit for the do-it-yourself go kart builder. Shipping was incredibly fast too... only took a week to get it up to Canada. Excellent parts and service. I purchased this kit in conjunction with free plans from kartfab.com and it went together great! I had a small issue with the tie rods, but Grant at kartfab and the guys at Gopowersports had my problem resolved the same day. I couldn't be happier with the build! Thanks guys! Fast shipping all the way even to Canada. All the parts look to be great quality. Even got an extra brake band which was unexpected. Thanks so much. Wish I lived closer. Cant wait to finish the build.